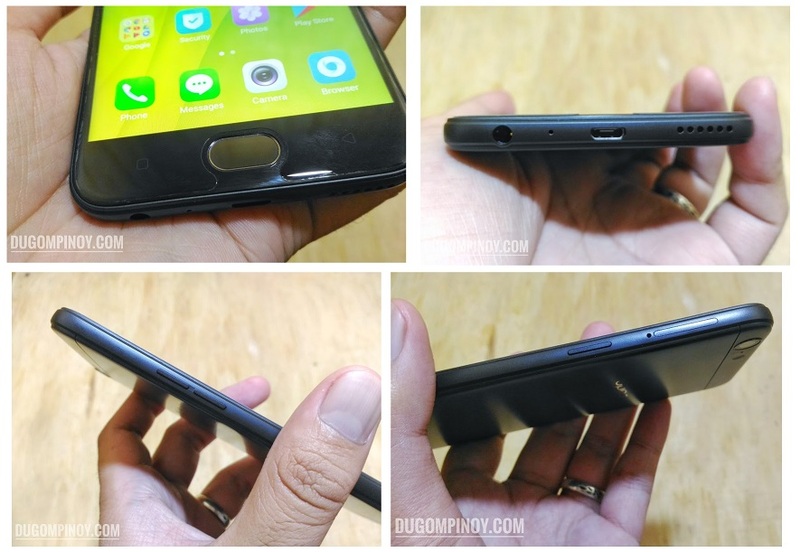 We go hands on with the latest selfie focused smartphone offering from OPPO called the A57. This is the newest device under the A series that OPPO has finally brought to the Philippine market which, like many other brand new smartphones from this Chinese company, also offers the best possible quality for your selfie needs at of course a much more affordable asking price compared to its high-end cousins from the F series. This new handset was just launched in the Philippines on June 13th together with the Black Edition of the F3 device. And luckily I was one of the people who just had an early access to it, thanks to our friends over at Tekpone electronics store here in Davao as they let me have my hands on one of their units. I was supposed to have this unit for at least a couple of days, but then we realized on the same day that we had a "sale demo" unit which is configured a little differently than the actual retail units. How? You know those on display smartphones at shops where they play some sort of promotional videos when in standby mode? This is one of those, so what happens is everytime I don't use this OPPO A57 unit, it automatically plays the video and at the same time wiping all the photos, videos, and screenshots it just had moments ago. Sadly there was no way of disabling this mode as it seems to be hard embedded in the software. That being said, I was not able to back up all of those files I had prior to discovering this. So this post does not have any sample photos, videos, and even screenshots of its actual interface. I still hope to get a regular unit for this OPPO A57 to explore it more and share with you my experiences. But for now, let me share with you my quick unboxing and initial impressions of this latest Android Marshmallow-powered smartphone that promises you to provide "Unstoppable Selfies," or as the slogan OPPO attributes to this model. When it comes to the packaging of this device, nothing is really new as the entire boxing is very similar to the previous and current OPPO smartphones on the market. It's in a white box with outer jacket that shows the device on the front with the A57 branding alongside it, and there you can also see the Unstoppable Selfies caption as well. Slide this off and you will be greeted by another white box with nothing but the word OPPO on its surface. You lift that secondary outer box to reveal the inside and see the A57 unit itself sitting right upfront. The variant I got was in black which is by the way looked very sleek and elegant. At first I thought it's going to be in gold just like what the box shows, but it's not. I am guessing all the A57 variants will come in the same packaging regardless of the actual color of the unit inside. But the accessories though such as the earphones, USB cables and charger brick, were all in white. 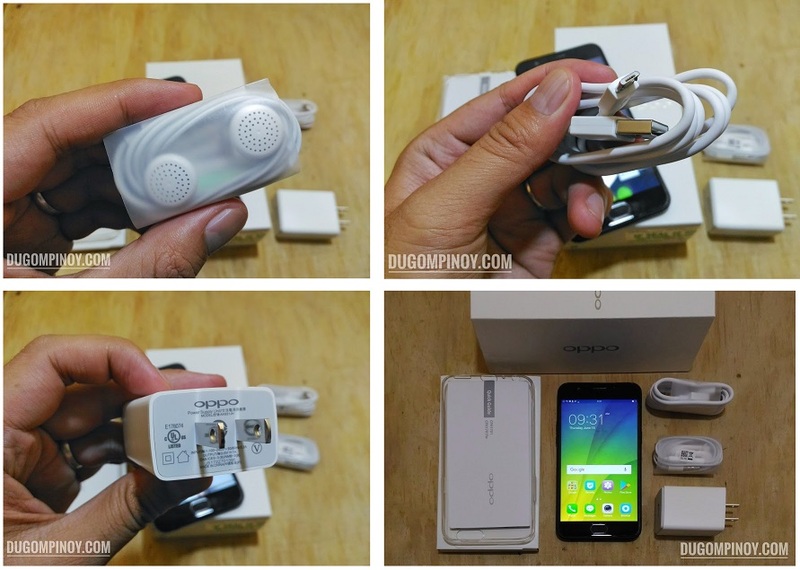 Apart from the OPPO A57 device itself, there are all the basic smartphone essentials in the box with it. There we have the non-fast charge wall charger, USB to microUSB cable, basic yet decently-looking pair of earphones, some paper documentations, and of course a free soft clear case for the device. It does not have its own USB OTG adapter, but it does support such functionality in case you are wondering. What about screen protector? It is already pre-installed on the screen right out of the box. 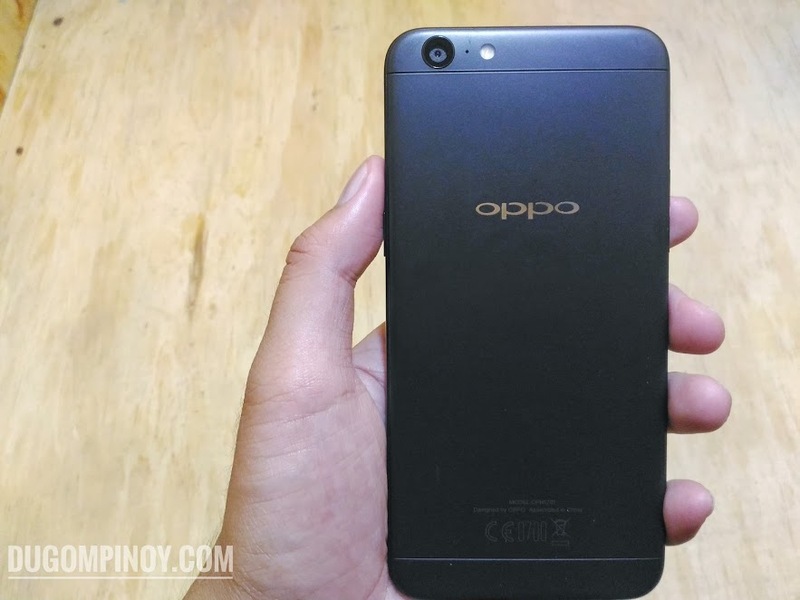 I don't know with OPPO, but I kind of like the way they "black" their devices. And it is nice to see that the Chinese handset-maker is now releasing more and more of their latest smartphone offering in this particular color which started with the release of F3 Plus early this year. Unlike the black variants of F3 and F3 Plus that were not immediately released together with the gold counterparts, the A57 in black and gold will all be released simultaneously. 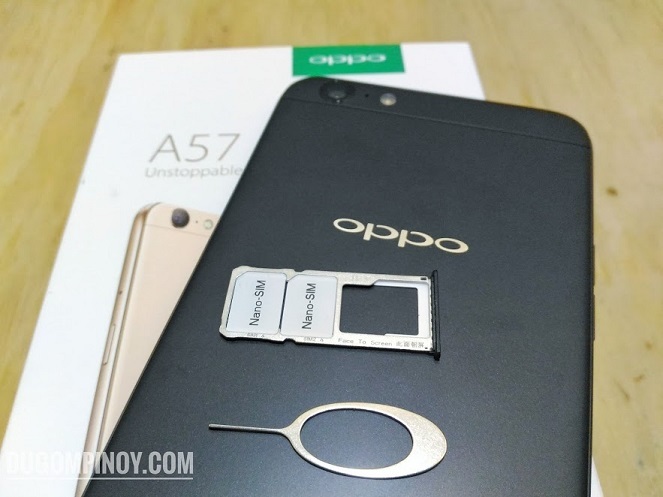 Design wise, there is really nothing to be excited about this OPPO A57 as it looks almost identical to the previous A and F series of devices from OPPO, most especially to the F1s which I also unboxed here. The phone is lightweight and yet still feels solid and comprtable to hold in the hand, thanks to its polycarbonate casing and chamfered edges. If you have held an F1s in the past, the experience is just the same except for the A57 is slightly smaller in dimensions having a 5.2-inch screen compared to the F1s' 5.5 display panel. 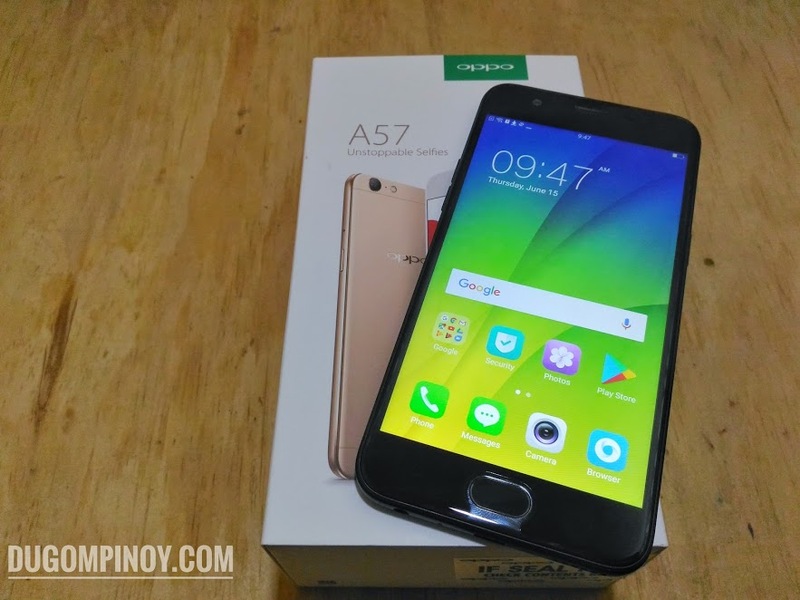 While the F1s is priced at Php12,990 and Php13,990 for the Upgraded version, the A57 is pegged at Php11,990 at launch. I guess we can safely say that the A57 is the younger sister of the F1s with slight differences and upgrades in a couple specs which I will discuss in the next section below. Now let's talk about the technical specifications of the OPPO A57 here. Two of its most notable differences from the F1s are the processor and software. Instead of the Mediatek MT6750 with Mali TT860MP2 GPU, this smartphone has a 1.4GHz octa-core Snapdragon 435 chip paired with Adreno 505 GPU. This processor, according to Qualcomm, is capable of supporting carrier aggregation technology with up to 300mbps download speed and upload of up to 150mbps. Then the OS which is now an Android 6.0 Marshmallow with ColorOS 3.0 on top, no more Android Lollipop, but we hope for a 7.0 Nougat update in the future really bad. The Random Access Memory or RAM is clocked at 3GB partnered with 32GB internal storage right off the bat. This device also supports microSD card up to 256GB, and the good thing here it has its own microSD slot in addition to the dual-SIM setup. 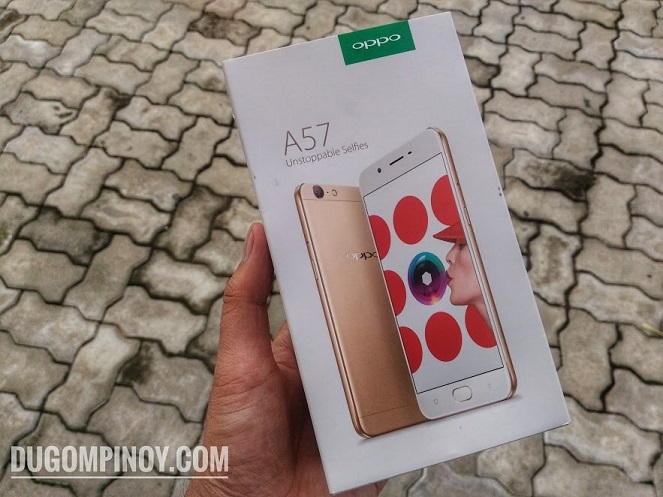 The OPPO A57 sports a 5.2-inch HD IPS display. That's equivalent to 1280 x 720 resolution and 282 pixel per inch density across the display panel. Similar to the current lineup of OPPO devices, the A57 also has 2.5D curved glass implementation and Corning Gorilla Glass 4 protection. Right below the display panel is where the fingerprint scanner is situated. This one is clickable and a simple tap will also bring you to the home screen. Its fingerprint scanning functionality works fast as well and almost instantaneously. Between the sides of this home button are the multitask and back capacitive and unlit buttons. At first you would think they don't exist because their color is heavily integrated with front panel's color, unless you look closer. Down at the bottom of the device are the 3.5mm jack, loudspeaker grill, mic, and microUSB port. On the right edge are the volume rocker and power/lock key, while on the other side is the three-slot tray for two SIM cards and a microSD card. It does not have dual front facing camera like those of F3 and F3 Plus but the phone still focuses on the selfie needs of its targeted users. OPPO put a 16MP front camera on this A57 with f/2.0 aperture and a 13MP rear camera on the back with f/2.2 aperture and an LED flash sitting next to it. As mentioned above I was not able to save photos taken by this smartphone due to its auto-delete settings in the sale demo mode. That does not mean though that I was not able to try the cameras, and based on that extremely brief time playing around with its shooters, what I can say is the experience and the quality of photos produced by this phone is also very similar to those of the F1s. That is because these two phones share the same camera configurations, 16MP front with f/2.0 and 13MP rear with f2.2 aperture lenses. 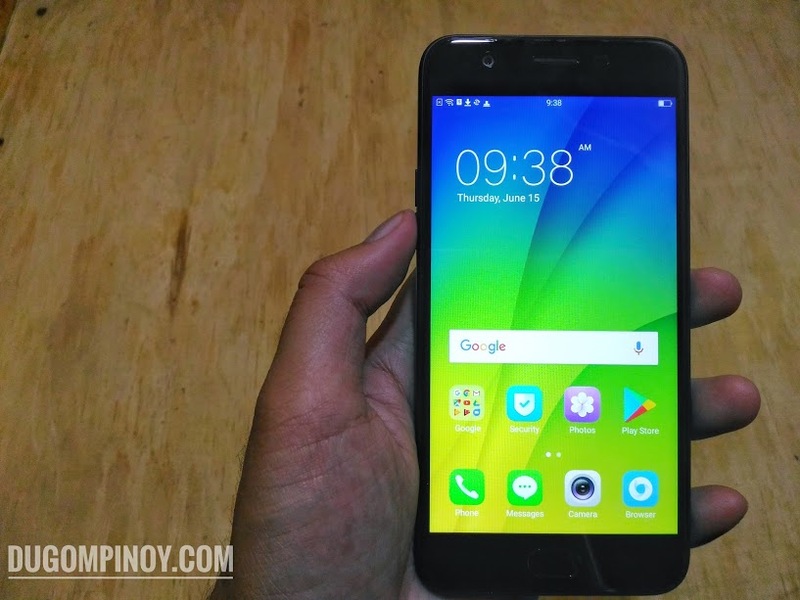 The OPPO A57 is officially priced at Php11,990. As for it's availability, it was initially announced that it would be available as early as June 16, 2017. But Tekpone store says it is not, however they pointed out that it will definitely be available either this week or next. 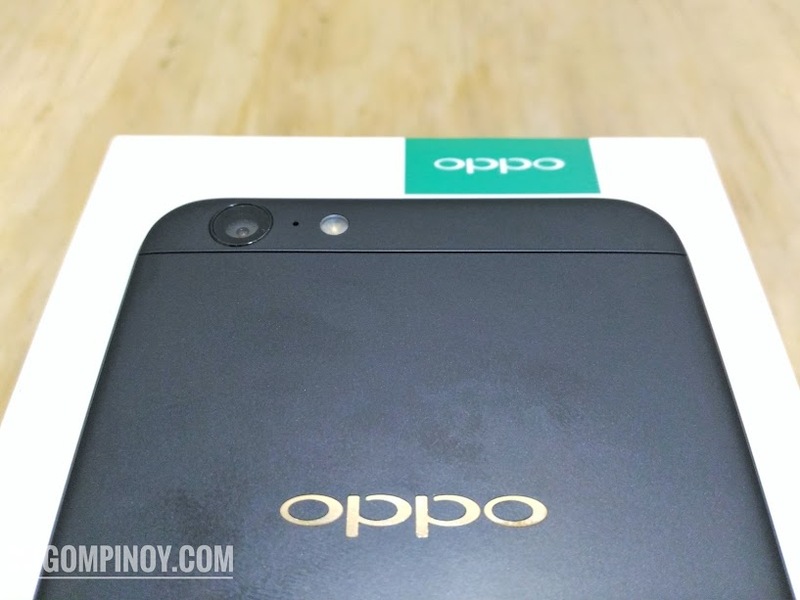 As of writing, the OPPO A57 is not available via Home Credit with 0% interest unlike other OPPO devices. You can still have it though via credit card installment with 0% interest, I was told.